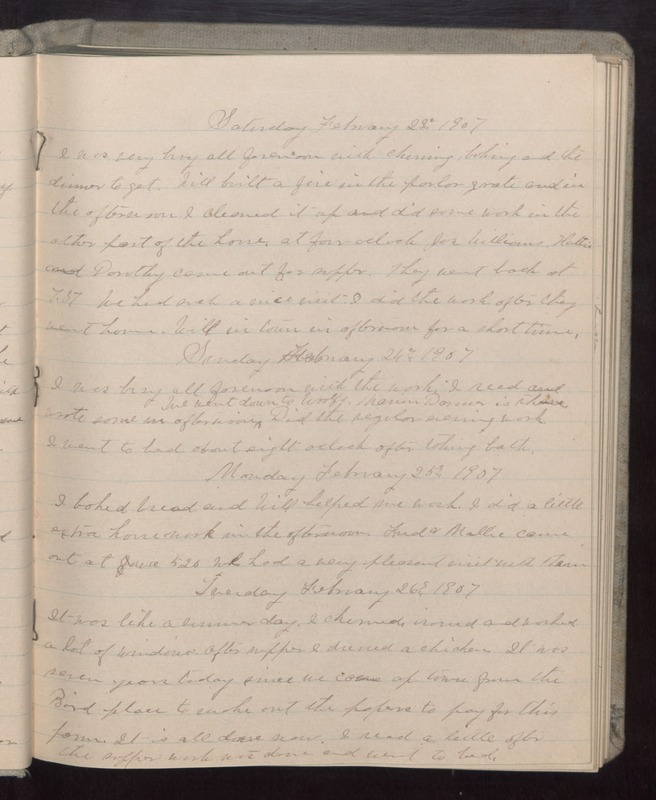 Saturday February 23 1907 I was very busy all forenoon with churning, baking and the dinner to get. Will built a fire in the parlor grate and in the afternoon I cleaned it up and did some work in the other part of the house. at four oclock for Williams. Hattie and Dorothy came out for supper. They went back at 7.37 We had such a nice visit. I did the work after they went home. Will in town in afternoon for a short time. Sunday February 24 1907 I was busy all forenoon with the work. I read and wrote some in afternoon. We went down to Woolfs. Marion [Donner?] is there Did the regular evening work. I went to bed about eight oclock after taking bath. Monday February 25 1907 I baked bread and Will helped me work. I did a little extra home work in the afternoon. Fred & Mollie came out at 5.20 We had a very pleasant visit with them. Tuesday February 26 1907 It was like a summer day. I churned, ironed and washed a lot of windows. After supper I dressed a chicken. It was seven years today since we came up town from the Bird place to make out the papers to pay for this farm. It is all done now. I read a little after the supper work was done and went to bed.